That is very cool. Can’t wait to see a video. 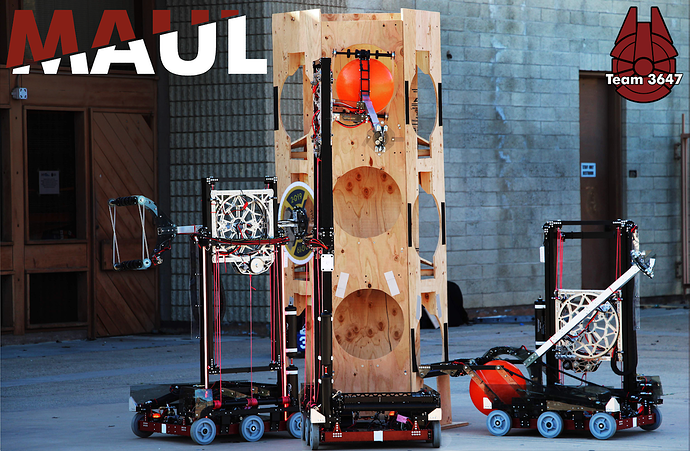 We’re still working on some new mechanisms and speeding up the robot so stay tuned for more! This robot is very fun. I’m a big fan! Love it… I REALLY want to hear the thought process that went into this solution. Can we make #sidewayselevatorgang a thing. If so we are in. Our Bot. Love the robot See y’all at SDR (and possibly practice ). We thought of this and definitely dismissed it as too crazy to pull off. Can’t wait to check it out at SDR! Awesome work, we’ll see you in San Diego! I like what I see here. Great work!!! It’s beautiful to say the least. Strong work. Climber on and practice bot (slightly heavier than competition bot) weighs in at only 114lbs! You can catch us at Del Mar Regional this weekend. So much envy. Just, so much. We were quite surprised ourselves how light the bot was when we first weighed it fully assembled. Using almost exclusively thinwall tubing really makes a massive difference. I have been working with this talented group of students for 3 years now and I am immensely proud of what they have accomplished here. Believe it or not, prior to last weekend 3647 has never won an award in their 9 years of existence and for the past 2 years our primary goal has been to work towards changing that both on the field and off. The improvements they have been making across the board have been nothing short of amazing and now they have results to show that the long hours have been worth it. This is my 10th year involved in FRC and I have to say this is the most entertaining robot I have had the pleasure of working on. When we started the season I had tried to reign in the expectations on what we could accomplish and this robot design was thoroughly in the “pipe dream” column in my mind for us to complete in time but they proved me wrong in the best way. I want to give thanks to Jon T. for being our awesome school faculty mentor. An especially large thank you to Klint K. for being the most dedicated mentor I have worked with. His children graduated from the school before the team was ever around and he has stuck around for Science Olympiad and FRC ever since, he has devoted countless hours to this program and deserves this just as much as the kids do. Congrats to everyone involved in team 3647.